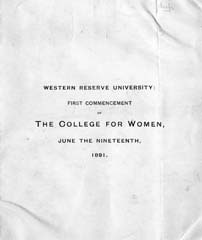 In 1888 higher education for women was not universally accepted as a worthwhile undertaking. Indeed, only a single student, Maude Laura Kimball, appeared on September 6, the College for Women’s first day of classes. Advisory Council member Cornelia Blakemore submitted a letter to the morning newspaper, The Cleveland Leader and Morning Herald, describing the array of educational offerings available, in an effort to increase the class size. The Advisory Council established a Committee on College Extension, which submitted reports to newspapers about the College and disseminated recruitment circulars. 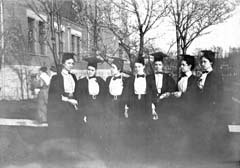 The Advisory Council held teas, musical events, and lectures to which were invited Cleveland opinion leaders “for the purpose of creating a more widespread interest in the work of the College and enlarging its influence socially.” The Advisory Council hosted receptions for such prominent figures as Amelia B. Edwards, author and Egyptologist; Alice Freeman Palmer, president of Wellesley College; and Jane Addams, founder of the Settlement House Movement and Nobel Laureate. Advisory Council members contributed funds for books for the library, tuition for the students, and furnishings for the buildings. The expenses for the early Commencement events were paid by the Advisory Council, including a luncheon for the seniors. 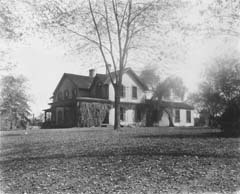 The Advisory Council raised and spent $3,700 for the initial expenses of the College’s first student residence, a rented building at 26 Cornell Road. In February 1889, the Council had pledged to cover the entire annual expense. 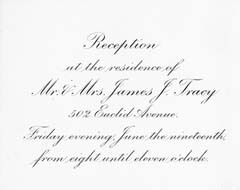 This was estimated to be $5,000 for rent, furniture, the matron’s salary, and living expenses of twelve residents. This personal engagement in the work of the College extended to relationships with students. 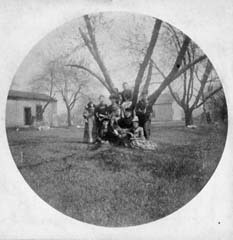 In the early months of the College’s first year, Miss Hurlbut was occasionally asked to supervise the single student during the Dean’s absence, an experience which she remembered as “…the beautiful September days when she sat in the hall with book or work in hand, the sunlight coming in the half opened door, listening to the subdued murmur of a recitation in Greek, Latin or English to Professor Perrin, Potwin or Smith.” In October 1890 Council members pledged to visit the College at least three times each year to meet the students, listen to recitations, and inform themselves about the life of the College.